Edgy. Dynamic. Athletic. 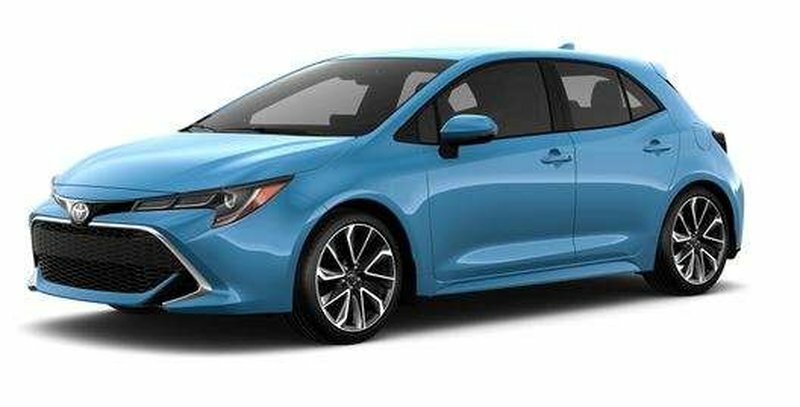 Introducing the all-new 2019 Corolla Hatchback. An exhilarating drive, fuel-efficient performance, hatchback functionality and next generation connectivity make the Corolla Hatchback a game changer. Life’s waiting, get to it in the all-new Corolla Hatchback. Standard equipment includes Entune 3.0 Audio, Entune App Suite Connect including -Traffic, Weather, Slacker, Yelp, Sports, Stocks, Fuel and NPR One (no subscription required), Scout GPS Link (3 year subscription), 6 Speakers, 8 inch Display Screen, Audio Auxiliary Input Jack, USB Audio Input, Advanced Voice Recognition, Apple CarPlay, Auto A/C, Rear Seat Adjustments: Fold Down Rear Seat (60/40), Smart Key System, Push Button Start, Toyota Safety Sense 2.0:Pre-Collision System with Pedestrian Detection and Bicycle Detection, Auto High Beam, Lane Departure Alert with Steering Assist and Road Edge Detection, High-Speed Range Dynamic Radar Cruise Control, Star Safety System:Smart Stop Technology (SST), Vehicle Stability Control (VSC), Anti-lock Brake System (ABS), Traction Control (TRAC), Electronic Brake Force Distribution (EBD), Brake Assist (BA), Headlamps: Bi-Beam LED Headlamps, LED Rear Combination Lamps. With this SE Upgrade package you gain even more equipment SE Badging, Rear Bumper with Chrome, Anti-theft System, Leather Wrapped Steering Wheel, Driver Seat Power Adjustable 2-way Lumbar Support, Heated Front Seats, Heated Steering Wheel, 18 Inch Alloy Wheels, Blind Spot Monitoring System and Wireless Charging.